The clouds thinned, letting through sunbeams of orangesicle and pineapple sherbet. And still, I waited. Darkness marched overhead, commanding the stars to sprinkle throughout the rich and silken sky. And yet, I waited. One wafen moon passed after another. And when I thought I could no longer stand it, bouts of fresh rain, clinging to the air like gum drops, beckoned a crisp new day. And when the ginger sun finally showed its face, I knew that fig season had arrived. This is the hyper-dramatic tale of how I waited desperately for fig season to arrive. This fig-tastic (yup, awesome fig pun alert) season has an extremely short run. To be exact, it’s the first two weeks of June and then a slightly longer stint starting in August and ending in October. That’s it! Today’s intro stemmed from my attempt to buy figs this week. The store was sold out. So I came back the next day and waited half an hour for the produce truck to do its nightly shift. To no avail (that fig-ures). The next morning, I got on the phone, called the grocery store, and put some figs ON HOLD. (Yup, you can do that. Otherwise, fighettaboutit). And on the way home from the store, figs in hand and happy as a clam, I heard a woman whisper into her phone, “did they release the body yet?” Yup, there are worse weeks. Smoosh your figs. Add the fresh figs, sugar, and lemon juice in a blender. Blend that sucker up until it’s consistent and smooth. FYI this makes enough puree for 5 cocktails, so either use it immediately or stick it in the fridge for up to 2-3 days. 1a. Shake it up. If you have a cocktail shaker, now is the time to find it. Maybe check the garage…it’s usually in there somewhere. 1b. Don’t have a cocktail shaker? Neither do I. Get creative by using some cheesecloth (which should be leftover from the Alotta Horchata recipe) and a rubber band. *Note: if you have a cocktail shaker, refer to parts (a). If you don’t, look for parts (b) below. 2a. Keep shaking!! If you have a cocktail shaker, just add the fig puree and honey and mix with a spoon until it’s consistent. Then, add the lemon juice, ginger beer, cognac/brandy, and ice. Keep shaking until it’s well mixed and very cold. 2b. Keep cheeseclothing!! If you don’t have a cocktail shaker, just use an ordinary tall glass. Add the fig puree and honey and mix with a spoon. Then add the lemon juice, ginger beer, cognac/brandy, and ice. Mix with the same old spoon until it’s all stirred up. 3a. Straining time. Strain the mixture into a fancy glass. I recommend a high ball glass! 3b. Cheesecloth time. Cut a square of cheesecloth bigger than the glass. Use the rubber band to secure the cheesecloth around the glass. Then, quickly yet carefully pour the mixture into a fancy glass (high ball it!). *Note: I went through four iterations to get this recipe right. I ended up running out of fancy glasses and settled for two very tiny mason jars. Go fig-ure. 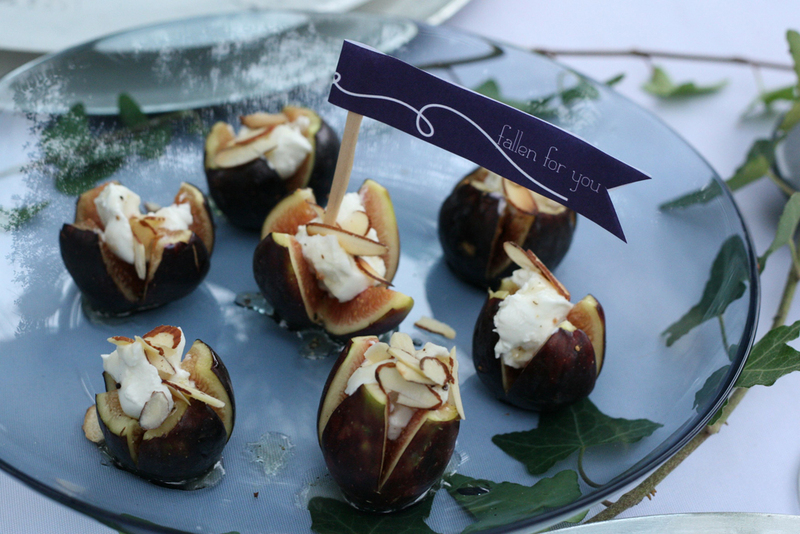 To be even fancier, you can use some extra fig (if you haven’t eaten it already) and stick it with a toothpick. This will be a delightful garnish and impressive for all house guests. (Or you can use mini mason jars like I did! They’re so adorable, I can’t get over it). Figs are somewhere between oranges and cherries in terms of staining. They leave behind a darker color, yet wipe away pretty easily. I ended up with fig chunks on the wall (not sure how), but it was an easy clean since I spotted it right away. Apparently #figlife doesn’t mean what I thought it meant. Clicks. Fancy figs for days. Check ’em out. There is such thing as a tiger fig. See it for yourself.